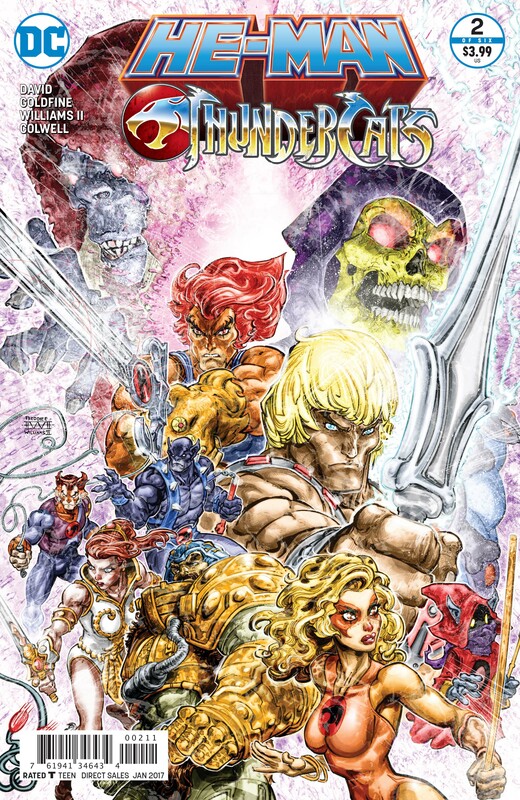 After an enjoyable opening issue packed with fan service moments, recognisable quotes and jaw-dropping splash pages, it’s time for DC’s much-hyped He-Man/Thundercats crossover to put its money where its mouth is and give the readers a story they can really sink their teeth into. And, with Skeletor finally getting his hands on the Sword of Power at the conclusion of the previous chapter, the groundwork has been laid for what should hopefully be a fresh, dynamic series. Unfortunately, right off the bat, the exchange between Skeletor and Mumm-Ra falls more than a little flat, never managing to have the impact that a bout of verbal sparring between these two ‘bad guy’ heavyweights probably should. In fact, as this series progresses, it’s becoming more and more apparent that, while Rob David and Lloyd Goldfine have some fantastic storyline ideas, their dialogue isn’t quite up to scratch. Unlike Eternity War, there’s no Dan Abnett on hand here to polish things up, and while the finished product is still a thoroughly enjoyable read, it doesn’t shine as brightly as it should, which is more than a little disappointing. Thankfully, one thing that definitely doesn’t need any additional polish is the dynamic, kinetic artwork of Freddie E Williams II. The bulk of this issue is made up of an extended battle scene as the assembled might of Skeletor’s cronies and Slythe’s Mutants try to take down the now sword-less He-Man. As could probably be predicted, things don’t go too well for them, and the skirmish features plenty of opportunities for Williams to flex his not inconsiderable artistic muscle. It’s also worth noting that this feels a lot more violent than some of DC’s previous MotU offerings, with frequent smatterings of blood as He-Man brutally pounds on his enemies. Oh, and the way he dispatches Trap Jaw and Tri-Klops actually had me doing a double-take in shock at its sheer brutality. Freddie’s artwork maintains its usual high standard throughout, although I’m still not completely sold on the style of Jeremy Colwell’s colouring, which feels a little washed out in places. Some of the splash pages are truly glorious though, including one particularly poster worthy double page spread of He-Man being ambushed by the aforementioned baddies, and the characters are all instantly recognisable from their action figure and cartoon counterparts – a vital point when you’re dealing with such beloved properties. Also, an additional tip of the hat goes to letterer Deron Bennett for the execution of the fantastic onomatopoeia, with a dynamic, in-your-face approach and some brilliant sound effects (including “concuss!” and “impale!”) practically leaping off the page. Story wise, this issue starts off in a fairly by-the-numbers fashion, picks up in the middle with some fantastic action, and ends by throwing an interesting curveball into the established He-Man mythos. Ultimately however, while the levels of fan service are off the charts, this feels at times more like an enjoyable slice of fan-fic than the polished, boundary-pushing comic that Eternity War was. Freddie E Williams II ensures that things look absolutely gorgeous throughout, but as a lifelong fan of these two franchises, I can’t help but find myself craving something a little more… substantial. Fingers crossed that things pick up once the inhabitants of Thundera arrive, which by the looks of it may be sooner rather than later.